If you’re looking for tips for feeding toddlers, here’s my approach as a Registered Dietitian. Spoiler alert- sometimes I serve two different meals! This post has been a long time coming. Literally. It’s been in my drafts folder for at least 6 months. I originally came up with the post topic on my own…but it kept getting pushed to the back burner. And then a few of you started asking questions. And then I got more questions. Bottom line is, people notice (especially those of you who follow me on Instagram) when you don’t feed your kids the same thing you’re eating. 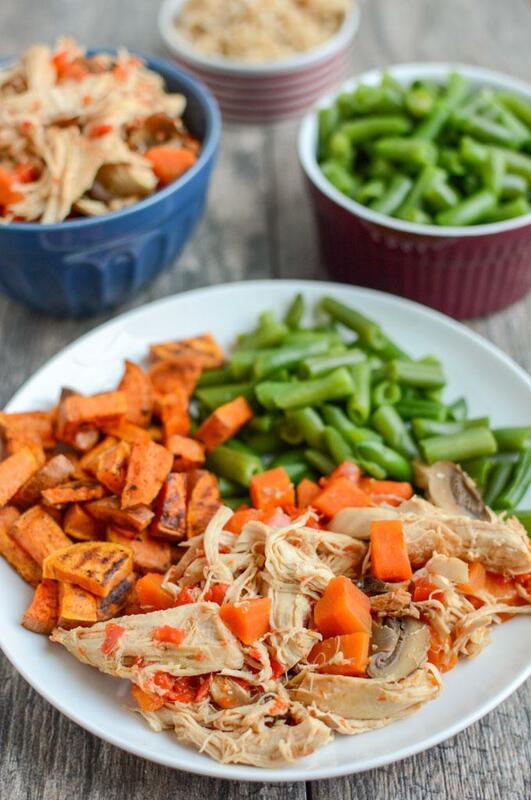 I believe that I can serve healthy foods to my kids without having to serve them the exact same meal I’m having. I realize that this may not be the most popular opinion, especially coming from a Registered Dietitian. And let me be clear that I don’t think there’s anything wrong with making one meal and serving everyone the same thing. 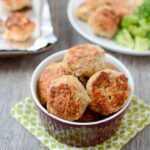 I know it works for a lot of people, I understand how it can be helpful for picky eaters and I think it’s a great idea if it works for you and your family. But I don’t think it’s the only option. And right now, I don’t think it’s the best choice for our family. As I share a little bit more about why, please remember that this is MY view about what works best for MY family. Every family is different and it’s possible that you will disagree with my opinion or think that what I do isn’t right for your family. THAT’S OK. I’m simply sharing my opinion in case it does help someone else out there whose thoughts or family are similar to mine. It’s also possible that my view will shift as my kids get older. Yes, I believe in Ellyn Satter’s Division of Responsibility when it comes to feeding children. The division of responsibility in feeding encourages you to take leadership with the what, when, and where of feeding and let your child determine how much and whether to eat of what you provide. At this age, it’s my responsibility to provide food for my kids. It’s their choice what and how much of it they eat. Right now, this topic mostly applies to Squish, who is 3. Little Miss is still a bit too young for me to put some of these rules about having seconds, etc into play. But in the coming months, when she reaches that point, I’ll do the same thing with her. My general overarching policy is that I decide what to put on his plate for dinner. If he doesn’t want to eat it, that’s fine. But he doesn’t get anything else until breakfast. Yes, there are nights when he goes to bed after eating only one or two bites of dinner. No, I don’t freak out about it. Kids are very good at eating intuitively and if he skips dinner, I trust that he’ll make up for it the next day or later in the week. I also often remind myself is that dinner is typically his worst meal. He is a very good eater at breakfast, and usually at lunch. He also eats snacks. By the time dinner rolls around, he’s just not always that into it. And that’s fine. When it comes down to it, the reason why I sometimes serve him something different is because it’s not that hard for me. And I would rather focus on the actual act of family dinner and us eating together vs. the what we’re physically eating. For example: Perhaps one night my husband and I are having taco salads with ground turkey taco meat, lettuce, rice, tomatoes, corn, black beans etc. Squish is not a huge fan of ground meat unless it’s made into a meatball. He also doesn’t love lettuce, or tomatoes, or corn or black beans. He does love tacos and quesadillas and he likes chicken. So maybe on that night, I would make taco salads for us and for him I would use some of the chicken that I shredded or baked during my food prep to make a hummus and chicken and cheese quesadilla, with a few black beans added in. Or I might make him a ground turkey and cheese quesadilla with a few beans to make it more likely that he would try the turkey. Or say we’re having chicken curry, which he has tasted multiple times and tends to not be a fan of….I might give him some rice, a small piece of naan that we’re having, a little curry and then a couple meatballs that I had made during food prep over the weekend and some carrots with ranch. In the photo above, hubby and I were having a skillet dinner with roasted potatoes, corn, peppers and onions, summer squash, pesto and shrimp. Squish is not a fan of any of those things. So he got strawberries, which he loves, noodles (which he loves) covered in pesto (which is relatively new to him but he eats occasionally), a little bit from our skillet, plus some parmesan chicken tenders that I made earlier in the week while doing food prep and just had to pull out of the fridge, cut up and serve. The bottom line is: yes, sometimes I make something and all of us eat the same thing. Sometimes I make something for hubby and I and give Squish something different using stuff I already had on hand (along with a taste of ours). And you know what? Sometimes I make something for my husband that he likes…and it’s not something I like….so I eat something totally different. And that’s ok too. It works for us and I still feel good about what my family is eating, without feeling pressured to always have everyone eat the same thing. 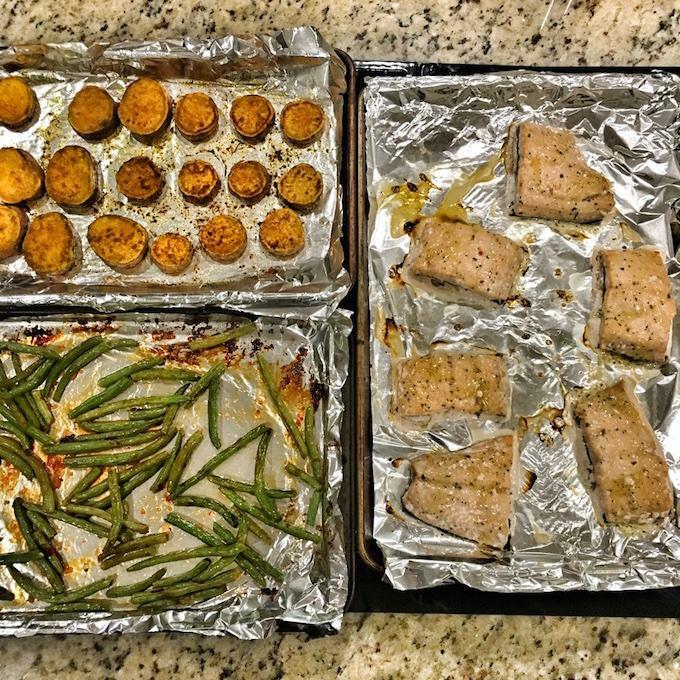 One thing I do think is important if you take this approach: You have to work hard at continuing to introduce your kids to new foods and a variety of flavors, cooking methods, etc. I don’t recommend just giving up and serving them chicken nuggets every single night for dinner because they don’t seem to like anything you’re making. There are definitely nights that Squish doesn’t eat what I serve him, even if it’s different from what we’re eating. And that’s ok. I work hard to make sure I introduce him to different flavors, spices, vegetables, meats etc, even if he happens to try them at a different time than I eat them. I focus a little harder on making sure he’s hungry. If he eats a huge breakfast and lunch, doesn’t get much physical activity and has several snacks on a certain day, then that’s probably not the best day for me to serve him something brand new for dinner…because he probably won’t be that hungry and he might not eat it even if he does like it. If it’s a day where he eats breakfast, goes to school and runs around all morning, eats a smaller lunch, takes a long nap and only has a small snack before dinner, chances are he’ll be hungry and also more willing to try something new on his plate. Or sometimes I’ll try something new at breakfast or lunch instead of dinner. I let him help make it. I try to do this all the time but especially for new recipes. I don’t make a big deal about it. I don’t say things like “ohhhh we’re having this brand new thing for dinner…i hope you like it….yada yada”. I just serve it the same way I serve every meal. I often mix it with something he likes. If I want him to try peas, I might mix them into mac and cheese, which he loves. Or if I want him to try ground beef or beans, I’ll put them in a quesadilla because he loves tortillas and cheese. I’m willing to keep things separate. If I want him to try a chicken and noodle dish with some kind of asian sauce, he likely won’t touch it if i serve it all mixed together, but if I separate out the noodles, the chicken and the veggies, he might try at least one part. What’s your policy if he wants seconds? If there is fruit on his plate, he will always eat that first. And he almost always asks for more. In order to get more fruit, he has to eat everything on his plate (including vegetables). If he asks for seconds of the main dish, I give it to him, even if he hasn’t eaten his vegetables. If he asks for thirds of the main dish, I tell him no, until he eats his vegetables. I will never force him to eat everything on his plate. But I won’t give in and give him more fruit just because he’s still hungry and doesn’t want to eat his vegetables. (For example in the photo above of the deconstructed chicken philly sandwich…he immediately ate the cheesy bread and orange, didn’t touch his peppers and ate some of his chicken. He asked for more bread and more orange, both of which I said no to, unless he wanted to eat the rest of his chicken and his peppers. He decided to be done for the night. Do you make him take a no thank you bite? No. I encourage him to try a bite of everything on his plate but I never force him to. Why do you sometimes serve dessert with the meal? I work hard to not put dessert on a pedestal. I firmly believe that restricting something only makes you want it more. Does that mean he gets dessert every night after dinner? No. Sometimes I include a donut with breakfast or a cookie with dinner. I don’t point it out. I don’t make a big deal about it. Sometimes he chooses to eat it immediately, but often, he’ll eat almost all his meal before even touching the dessert. If we make cookies in the afternoon, I let him eat one. 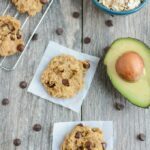 In other words, my own approach to healthy eating is that cookies, desserts and other sweets can easily be included and the same goes for my son. Why do you feed your baby something different if she rejects the first thing you give her? First of all, my daughter is a very good eater. She’s almost 14 months and she eats A LOT. She’s not very picky (similar to her brother at that age) but I think that will come later. She’s also still learning. For the past several months, my focus has been on exposing her to a variety of foods and providing food for her to eat. Soon, she’ll reach the age where she’s consciously deciding not to eat something just because she’d rather have something else (ie getting pickier). At that point, I’ll start taking the same approach that I take with him, where she can eat what I give her or not eat until morning. However, right now, I’m happy to give her another option so that she’s eating something. Right now, that means occasionally giving her a different protein source, some extra vegetables or some more healthy fats to help her grow and develop. 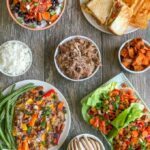 How do I choose what meals to make during the week? I do cook a lot of dinners on the fly (hence the upcoming ebook) but in general, I try over the course of the week to cook some kid-friendly recipes that I know everyone will like, some that I can easily separate into different components Squish can eat the separate parts and hubby and I can eat it mixed together and one or two that I don’t think he’ll eat, in which case I’ll serve him something different, but also put a small serving of what we’re having on his plate. 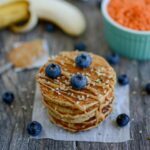 Do you serve your kids foods you don’t like? Yes. This is something I work really hard at. I was world’s pickiest eater for 25 years and even though I’ve gotten a lot better, I still lean towards the side of picky eating and there are a lot of things I don’t like. That doesn’t mean my kids won’t like them. But it COULD, if I don’t expose them to these things. Luckily, my husband is NOT a picky eater. So I often cook things for him that I don’t particularly like. And I use those opportunities to serve those foods to my kids as well, without showing my bias or opinion, so that they can form their own opinions. 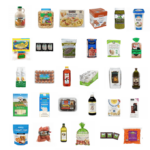 This includes everything from vegetables like asparagus and cauliflower, to meat like beef. Why do you keep serving stuff they don’t like? Whew! Ok I think that’s it for now. Lemme know if you have questions! This is AMAZING, Lindsay! I approach Camille the exact same way. Camille gets what we are eating, but if I made something a little funky, I pull things from the fridge that I know she likes and then give her a taste of what we’re eating. Heck, sometimes I think she eats even healthier than us because if our meal only has 1 veggie, I’ll add bell pepper strips from the fridge (which she adores) or maybe even peas from the freezer. 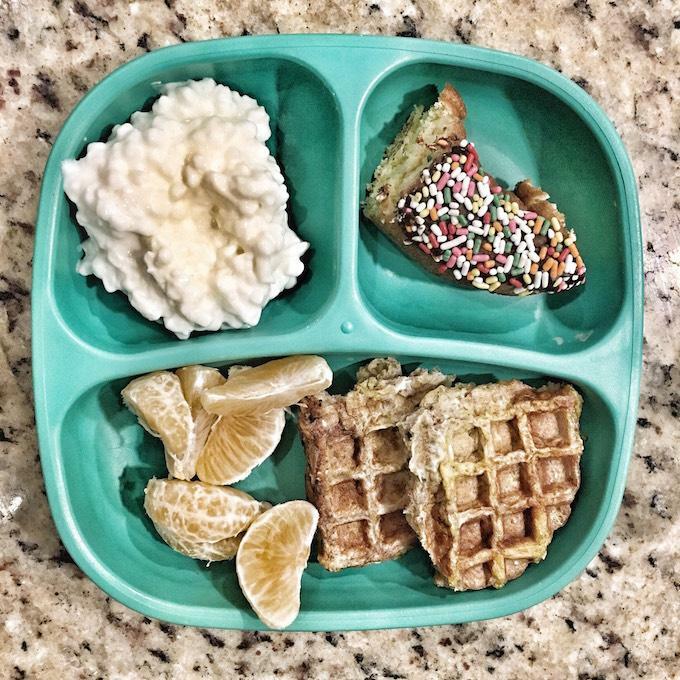 Honestly, my New Year’s resolution is to eat as healthy as my kid does! I always ensure her plate is colorful, but never my own. I always make sure she eats breakfast, but I never do. Isn’t that crazy? Anyway, just wanted to say that this post is amazing! I’m so relieved that another mom does the whole ‘if you finish your X, then you can have more Y.’ I was worried I was forcing her to eating things, but it doesn’t sound like it! Camille is the same way about fruit–she loves it and eats it first! And I can usually get her to eat anything with the promise of fruit again for dessert. I thought I would be super strict about sugar when Camille was little, but as it turns out, I’m not. She is such a good eater (loves salmon, broccoli, beets & sauerkraut), that I generally let her eat dessert whenever she wants. Plus, since her belly is full from dinner, she only eats a few bites of dessert anyway. I keep telling myself that this is good, because I was NEVER allowed sugar as a kid, and well, look at my career-HAH. ok, I’m rambling, THANKS FOR SHARING THIS. 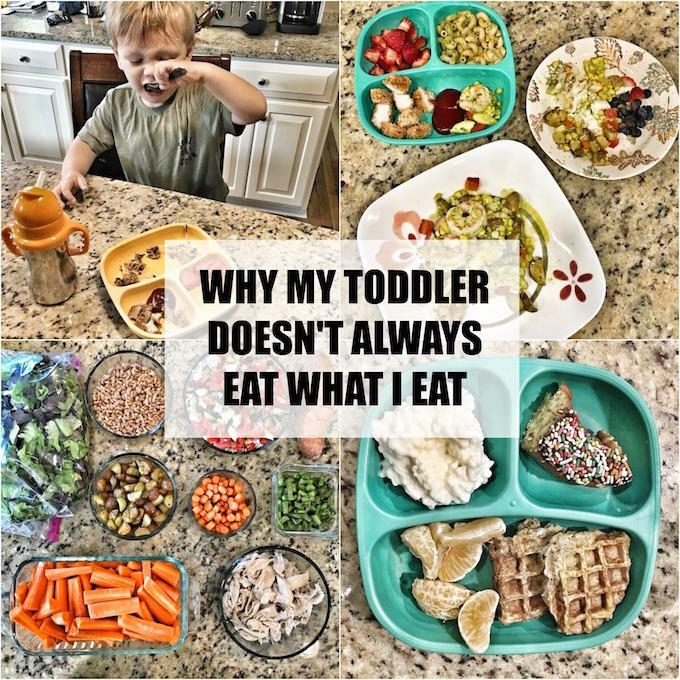 I admire you so much as a mom, friend, and nutritionist, and this post really helped calm me down about the way I feed Camille! You are so welcome! You’re doing an amazing job, mama. I love seeing what you feed her and all the great stuff she eats. Feeding kids can be so tricky and there’s definitely not just one way. But it always helps to find people who are doing things similar to the way you are! My 3 year old is a champion picky eater and dinner time is always super stressful. I want to move towards feeding him more like this but it’s tough with both Hubs and I working out of the house full time and kiddo being in daycare. We’ll get there. I just HATE wasting so much food by serving him things I know he’ll never eat. Reading things like this definitely gives me guidance and reassurance that we can (and will!) figure out a solution that works for us! Thanks for sharing! You definitely will! Hang in there mama! Feeding kiddos is so tough. Thank you so much for this post! It’s really inspiring to a first time mom who is totally clueless about what to feed my child. 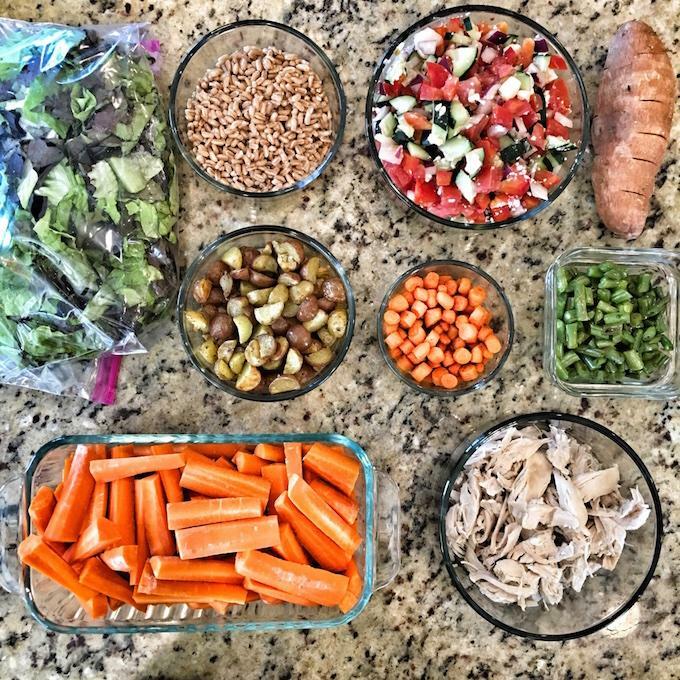 I started following your blog to store away food tips for my child as he got older, but since you mentioned that you have an almost 14 month old, I have to ask…what do you feed her? My son just turned a year old and was very slow to get teeth (he still only has four that aren’t all the way in) so, I was very hesitant to try foods other than baby food. He’s now very interested in what food is on the table and will turn his head and say no to baby food sometimes. He eats a little bit of table food, but not much. Should I just start giving him chunks of anything and everything to see what he will eat or is there a more systematic method? My pediatrician hasn’t been much help on this subject so, I thought you might have some better advice. Thanks so much! 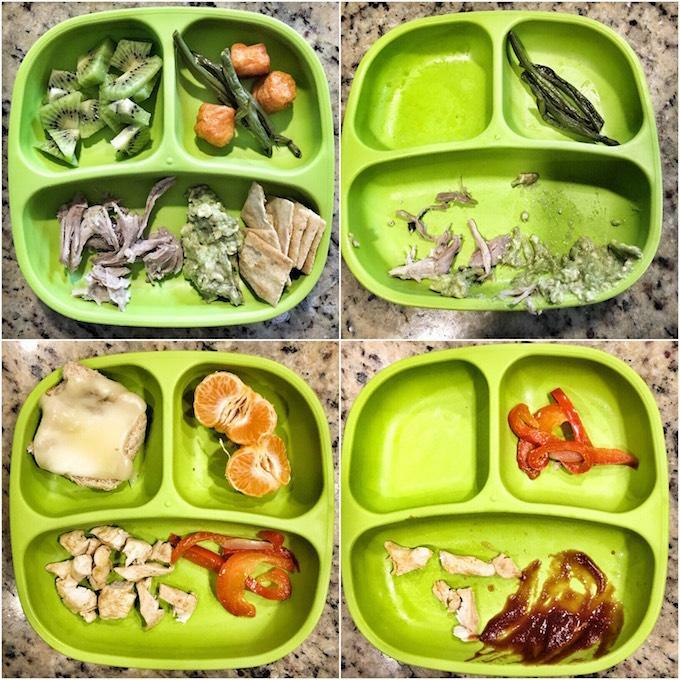 i wrote a post on how i modified babyled weaning when i started with my son a few years ago: https://www.theleangreenbean.com/modify-baby-led-weaning/. If you’re on Instagram, you can follow me and watch my stories. I try to show before and afters of the lunch and dinner plates I feed both my daughter and son. I’ll try to do a better job of keeping track of her plate photos so i can put them in a post! 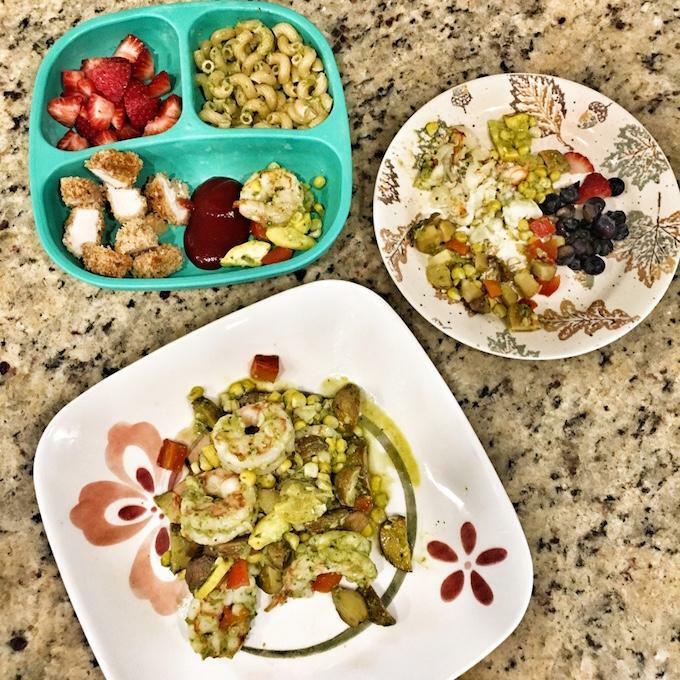 Also if you go here: https://www.theleangreenbean.com/quick-toddler-meal-ideas/ and look at especially some of the other roundups of toddler meal ideas that i link at the bottom of the post you can see some of the plates i was feeding my son when he was younger…like 1-2 years old. And finally, check out the book Born to Eat, written by two of my RD friends all about babyled weaning. Lots of great examples for getting started on solid foods not purees! I love this approach and appreciate you sharing. 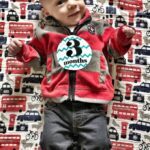 Your toddler posts are what brought me to your blog, and I find what you share regarding that, and beyond, very helpful! I’ve always been a foodie. Food was the thing I was probably most excited about when we had our first child. That quickly ended when we discovered he had multiple food allergies at just 6 months old-before we introduced food at all. He is 2.5, and we’ve had to do things differently than I expected to knowing he had an anaphylactic reaction to formula and also developed an egg allergy somewhere between 8 months and a year. We’re taking steps to help him “outgrow” his allergies. The current regimen for doing so requires that he eats a muffin daily (baked eggs and milk), and a small slice of cheese pizza (baked dairy) daily to increase his tolerance in hopes that he can have both dairy and eggs safely in the near future. Outside of those things, I offer him healthy sides, and snacks-plenty of fruit, veggies, soy/dairy free yogurt. Though its a goal I have, I’ve never been able to regularly feed him what my husband and I eat, and I’m okay with it right now. Anyway, this is super encouraging for me. oh man! food allergies are so tough. I hope your little guy successfully outgrows them. hang in there! sounds like you’re doing a great job! Thanks for sharing your approach! It seems to be pretty close to the method I’ve figured out for my 3 yr old, but I’d like your opinion about a recent pattern we seem to have fallen into. Similar to your son, mine is not always super hungry at dinner time. Even if he likes what I’m serving, he may only take a few bites before wanting to be excused from the table to go & play. Rather than force him to eat, I let him go but will leave his plate on the kitchen table. Often, he will come back at some later point to nibble on what’s there. Sometimes he makes repeat trips until he’s eaten everything. I worry about how this will affect his eating habits and/or whether this is setting us up for dinnertime problems as he gets older. I get the feeling from your post that you give your son one chance for dinner and after that, it’s no more food until breakfast. Any thoughts you have on this are welcome! So, depending on the night, i do sometimes save his plate in the fridge. Usually only on nights where he barely touches his food. If he asks for something else, I let him go back to the kitchen on time, sit down and i get it out so he can eat off his plate again. After that he’s all done. I do it because I do think sometimes he’s not hungry…especially if we’re eating early, but like you said, i don’t want him to get into the habit of just coming back over and over again because we do already struggle a little bit with that at lunch. So i give him the one chance and then put it away for good until breakfast. I like this post and think it has lots of ideas for people to consider in what works for their family. My children are older (6 and 7), and I don’t prep meal components the way you do, so more often than not, they get what we get. However, I like the idea of serving something different some nights (and we do so about once a week), because there are foods that despite exposure my children just don’t like/won’t eat at this point. 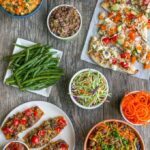 A few years ago I felt like my meals were becoming limited by what my children ate in a way that made food less enjoyable for me. So once a week the adults eat something that the children don’t like and they get a quick (but healthy) pasta dish, leftovers, or eggs/broccoli/toast for dinner. Probably once a week we also have tacos/fajitas or something where you assemble your own and they have a pretty different creation than the adults, even though we all had same choices. We try to limit dessert to weekends unless there is a special occasion because otherwise it becomes something they expect every day. i agree! i don’t think most kids are ever going to like EVERYTHING, just like adults don’t….but that also doesn’t mean adults need to be relegated to eating mac and cheese and chicken fingers for 10 years because it’s all their kids like. Thanks for sharing this. 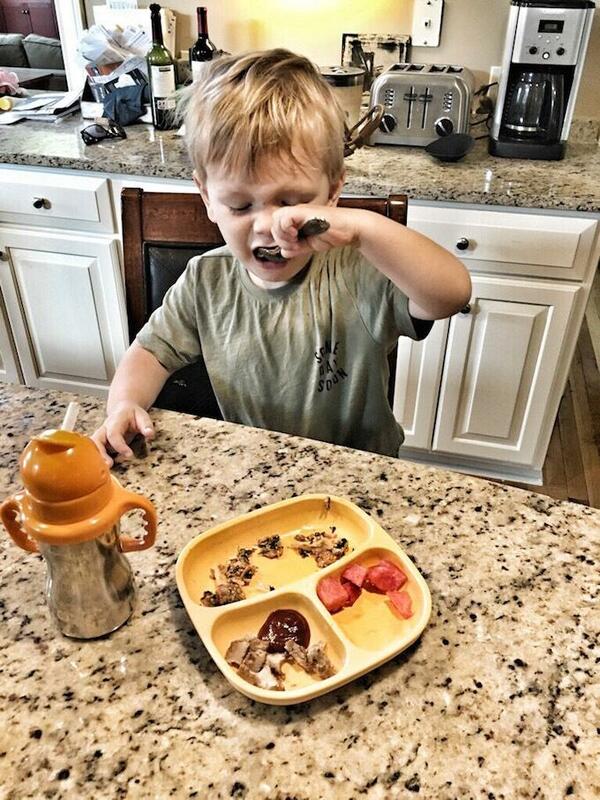 My 4 year old has been picky since he first started eating solids. It’s stressful and I don’t like dinner time because of it. So I appreciated hearing some thoughts on how you do it. You’re welcome! Hang in there! Picky eating is hard! I have another post on picky eating coming up too so stay tuned. I LOVED THIS POST!!!! Thank you for sharing it. What a breath of fresh air among all of the toddler eating articles out there that make me feel like I’m ruining Chase if I give him anything other than exactly what we’re eating for dinner. Thanks for sharing your thoughts in such a relatable way. I am still waiting for the day Chase’s eating doesn’t totally stress me out but in the meantime this post really helped me feel better about the way we approach his eating. That’s the main reason i wrote it! I feel like every article out there tells you everyone has to eat the exact same thing and I just don’t think so! xo hang in there mama. You’re doing great! Ugh thank you for this. My 18-month-old was a super awesome eater for awhile but has gotten pickier over the last few months. I seriously JUST told my husband earlier today that I feel like we’re limiting what we eat lately just so we can all three eat the same thing. For example, she really likes meat but I prefer to eat mostly veggie-based meals with meat maybe once a week…I’ve just been scared to cook that way lately because I know she won’t eat it. But I just put together a meal plan for next week that takes this exact approach you’ve outlined. I’m going to serve her a little of what we’re eating with a few things she’ll definitely eat and we’ll see. Dinner is usually my kid’s worst meal, too, and accepting that is freeing, ha. Anyway, all that to say that I really really appreciate you sharing your experience and opinion! It truly helps! i’m so glad to hear it! Hope next week goes well for you guys!! Love this. And it this is how my family works. 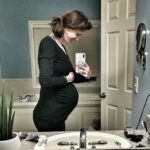 I read another blogger who feeds her children what she and her husband eat and has a firm rule about it, and it makes me feel horrible about myself. 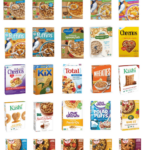 Bottom line is my daughter is still eating nutritious foods. Just not the same foods my husband and I are eating and that’s ok. She’s 5, I don’t expect her to think spicy Thai Curry is delicious. She’d rather have a “snack plate” with black beans, avocado, broccoli and carrots and some rice. It’s nutricious, she eats every bite and she’s thriving. At the end of the day isn’t that what matters most? Thanks for sharing, Lindsay! I like how you say you don’t make a big deal about it, like serving dessert, etc. I’m due with my first in a few months and love to get some insight now. Loved this post! As I fellow RD, I completely agree and have the same approach! I feed my kids the same way, usually a modified version of what we are eating or something totally different. It’s easy for me to get into a routine of offering the same things though! Honestly even the meals I make for my husband and I can get repetitive. It’s a constant reminder to keep exposing all of us to new foods and cooking methods. Ironically my 4 year old is a problem feeder so he keeps me on my toes! I think it’s important to keep it positive and not stress about meal times as you mentioned. yes yes yes. I’m all about eliminating stress! Wanted to also chime in that YES! This was great to hear from a mom and RD! My kids are ready to eat dinner right at 5, and most nights, my husband isn’t home, I’m not hungry, so that’s just not real life for us. Their dinners sometimes include leftovers from our dinner the night before, or I can make similar items for all of us, such as pasta that everyone can eat, but I know the adults get sauced differently than toddlers. 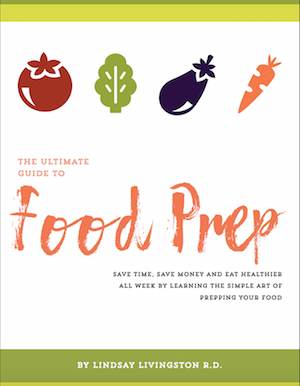 Have you heard of the “like it, love it, learning it” approach from Veggies and Virtue? http://veggiesandvirtue.com/blog/food-exposures-that-work That’s not me, just an approach I’m trying with my 1 year old twins. Yay! And yes, she’s actually working on a guest post for me next month on picky eating! love her approach as well. I love your approach! Especially giving him a bit of what you guys are eating, just in case he changes his mind about trying it. I also love that it’s so intuitive, and you never force him to eat anything. Such an awesome way to create a healthy relationship with food in kids! This was a great read! For the moms who despair of ever having their kids try or like foods that you’ve served over and over, just keep on trying. My 6 yr old this week declared that he LOVED ‘meat’ (steak) after always refusing to eat it. I’m pretty sure I’ve served it to him at least 40 times and it just clicked this week and he was willing to try it again (no pressure from us). yes! we recently had that situation with avocado. so rewarding! My husband I are caring for our 1st foster daughter who is about to turn 3 in a month. How would you approach feeding her more healthy foods at this age? She has not had a healthy diet up until now. We rarely get her to eat any veggies and only a few fruits. We made some great strides a few months ago but it seems like lately she is only getting pickier. I know I have to pick my battles with foster children and some foster parents believe that food is not a battle worth picking. I’d like to at least try to get her to eat healthier but I am not sure where to start. We do not have have any biological children so this is our 1st go around as well. Thanks for any advice! i would say just keep trying. keep serving the fruits and veggies. try prepping them different ways – raw, roasted, sauteed, steamed, etc. Serve them hot, room temperature, cold. Serve them with dips like hummus, ranch, queso, guacamole, yogurt, etc. Puree them into sauces, use them in baked goods, blend them into smoothies, etc. Just don’t give up! I think introducing them to healthy foods is so important. Let her help in the kitchen, pick things out at the grocery store, etc! So I’m at the point with my five year old that I think I might need to see some kind of food counselor! She literally will NOT eat fruits or vegetables (even in smoothies). If there is any kind of sweet food in our home she will just focus on that food and refuse to eat anything else. I hate to take all sweets out of the home but it really creates a problem when they are there. Have tried just putting the food in front of her and if she doesn’t eat it then she doesn’t eat til her next eating opportunity but then it’s absolutely miserable for the whole family for those few hours because she’s HANGRY. So we try that for a couple weeks and then I just don’t want to deal with the tantrums. I have a 10 month old who eats great but I worry that his sisters going to influence him to be super picky. I know so much of it has to do with me as a parent but I really worry I’ve messed up her eating for life! I feel like I gave her way too many purees and fruits as a baby and now she can’t handle textures and just likes sweet flavors. We are doing baby led weaning with my 10 month old and hoping that will help with him. Anyways…. I’d love any suggestions for maybe some kind of nutrition counselor for parents of little kids or any other resources. i don’t think you’ve messed her up for life! but i’d definitely look for a pediatric dietitian in your area to help reduce some of the stress on all of you! Love this post! We do a similar approach to this and I really like your guidance on offering seconds as I’ve struggled with that. Also funny, because I read it the night after having taco salads, just like in your example. I decided to give my daughter a little of what we had and then I made her a cheese and sweet potato whole wheat quesadilla. She loves all three items (well, at least she likes bread, but isn’t completely familiar with a tortilla), so I figured this would make a perfect dinner for her. Absolute fail. This has happened before-figuring that since she likes the parts I’m putting together, that she’ll like them combined. I apologized for serving her so all unfamiliar foods and ended up giving her cheese, sweet potato, and avocado separately, as well as some yogurt with a little cereal on top. Not one of my finer mom meal moments, but we all made it work. hang in there! it’s tough navigating the waters of toddler feeding. sounds like you’re doing great!